LEGO® bricks are a timeless hit in our family. I love them because they keep my kids thinking and entertained without sitting in front of television. I also love that my kids prefer them to playing their electronic games so they are a big educational win for us. I love seeing my husband and his girls creating cool things from their imaginations. If you like LEGO® bricks just as much as we do, here is their July 2014 LEGO® calendar. Arrive by 3:30pm, most stores only receive 500 tickets and pass them out to those in line at 4PM. Participants must have a ticket. Start and End Times: 5-7 PM, each mini build is different and children are expected to try to follow the instructions. After you pick up your ticket go and enjoy Kid’s eat free day (only on Tuesdays) at Chevy’s, just remember to return before 7pm so your kids can do their mini build. 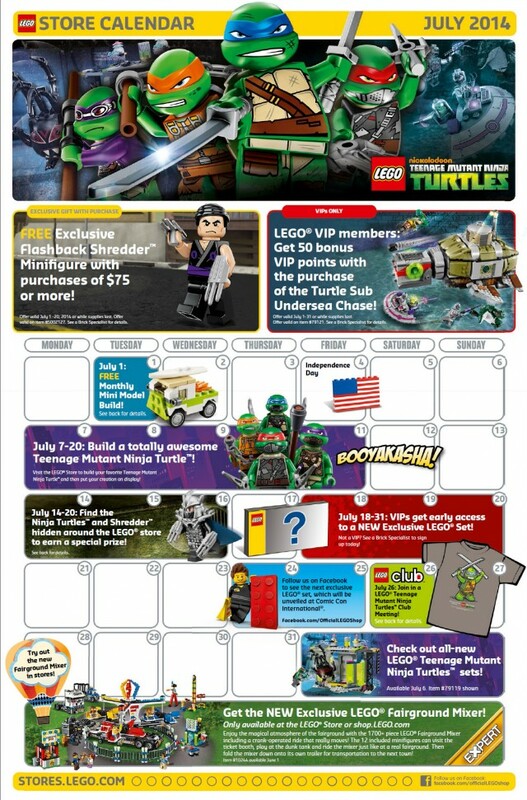 GOING ON ALL MONTH: A FREE ExclusiveFlashback Shredder™ Minifigure with purchases of $75 or more! LEGO® VIP members ONLY: Get 50 bonus VIP points with the purchase of the Turtle Sub Undersea Chase! GOING ON ALL MONTH: Get Special Bricks and Elements at the Pick a Brick Wall! This month: A whole new wave of elements is coming to the Pick a Brick wall! July 1st: FREE Monthly Mini Model Build! July 1st: Get the NEW Exclusive LEGO® Fairground Mixer! Available July 6th: check out all-new LEGO® Teenage Mutant Ninja Turtles™ sets! July 7th-20th: Build a totally awesome Teenage Mutant Ninja Turtle™! July 14th-20th: Find the Ninja Turtles™ and Shredder™ hidden around the LEGO® store to earn a special prize! July 18th-31st: VIPs get early access to a NEW Exclusive LEGO® Set! July 24th-25th: Follow us on Facebook to see the next exclusive LEGO® set, which will be unveiled at Comic Con International®. July 26th: Join in a LEGO® Teenage Mutant Ninja Turtles™ Club Meeting! If you attend a Lego mini build or find these updates helpful, please leave a comment letting me know. Previous PostReview and Giveaway: Shazzy Fitness Christian Exercise DVDsNext Post Why is beauty such a big deal?